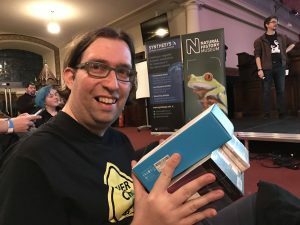 PRIZE: An Amazon Echo Dot and home automation bundle, donated by NEXMO. 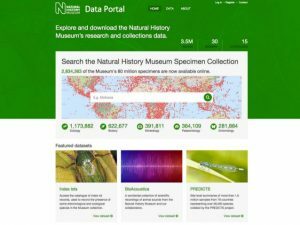 The Natural History Museum in London is committed to open access and open science, and has launched the Data Portal to make its research and collections datasets available online. It allows anyone to explore, download and reuse the data for their own research. Our natural history collection is one of the most important in the world, documenting 4.5 billion years of life, the Earth and the solar system. Almost all animal, plant, mineral and fossil groups are represented – and we’re inviting you to get involved! WINNERS: The winners were Gilbert Sinnott and Jack Bush with their entry Binaural Bioacoustica – “Inspired by the talks given earlier in the day on WebVR and physical-digital interactions, we wanted to create something playful and experiential that would stimulate the senses with what was available on the NHM site. The Bioacoustica recordings caught our attention both as a historical and ambient-aesthetic resource. and we first wireframed a real-time GPS exploration that would take place outdoors. Participants would be able to hear these centuries old recordings binaurally through headphones, and hunt them to their source. At the source would be an associated image or model alongside further classification information from the NHM databases. Whilst the end result isn’t GPS mapped – in the sense of moving the camera along LAT/LONG to find nodes – it isn’t far off. At the moment desktop users can explore the space using keyboard controls, and Android and IOS users with WebVR viewports (though IOS restricts the audio). Making it first started with parsing XML data into JSON and downloading the audio locally so that it could be converted and streamed in OGG. The augmented reality experience was then created with WebGL / WebVR through A-Frame and Three.js to plot the recordings in 3D space. 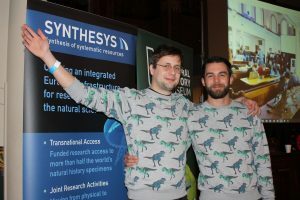 PRIZE: Funky dinosaur sweatshirts, for the stylish data analyst, from the Natural History Museum. Crate are big fans of data. Big data, small data, open data. We want to see what you can do using the CrateDB, oodles of data, and the limitless power of your imagination. 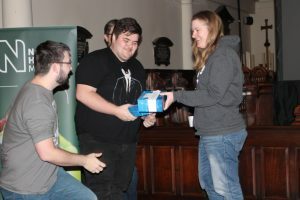 Luckily for our happy hackers, a SQL database shouldn’t be too hard to integrate into most projects, letting us focus on judging entries that use CrateDB to build creative, compelling projects around interesting data. Libraries are available for Java, Python, Ruby, Go, etc. so choose your flavor. We’ve put together some demo applications here to get you started! 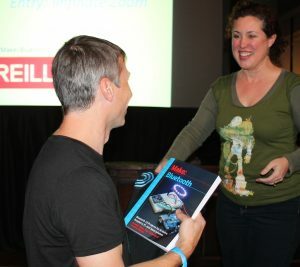 PLUS: “The LEGO Christmas Ornaments Book”, “The Maker’s Guide to the Zombie Apocalypse”, and “Arduino: A Technical Reference” from O’Reilly. This category is the Audience’s selection. We come up with a new way to run the vote every year, and this year’s voting mechanism will be created using Nexmo the API. 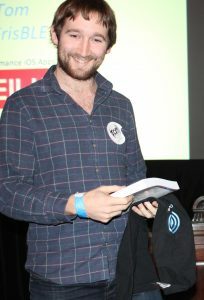 WINNER: Tom Durrant for his entry FrisBLE – a bluetooth connected Frisbee containing an accelerometer/gyroscope which is used to calculate when the frisbee is thrown, how much it spins, and when it is caught. It also uses a bluetooth beacon to tell which player the frisbee has been thrown to. PRIZE: A current generation Apple TV (which are compatible with Twitter Fabric, and support the new Twitter live-streaming app! ), donated by Twitter. 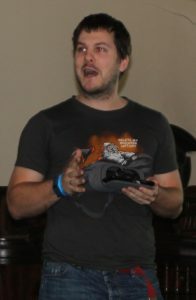 WINNER: Tom Durrant for his entry FrisBLE – a bluetooth connected Frisbee containing an accelerometer / gyroscope which is used to calculate when the frisbee is thrown, how much it spins, and when it is caught. It also uses a bluetooth beacon to tell which player the frisbee has been thrown to. WINNER: Dom Hodgson, Alistair Macdonald and baby Scarlett, for a tongue-in-cheek “wearable technology’ “windows’ entry – the Stupid Christmas Thing – a creative hack featuring a cardboard box, plastic cups, Nexmo sticker technology, and LED lighting. 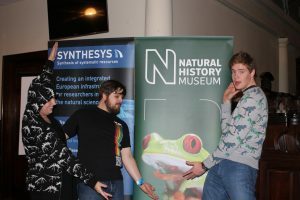 WINNERS: Steven Frazier-Roberts, David Rufus, and Nicky Main-Reade for Quest – “We took on the Natural History Museum’s challenge to help the public understand, use and engage with their open data. We took the iCollections set of objects and samples and drew them these items that have been discovered near you on a map with a timeline. 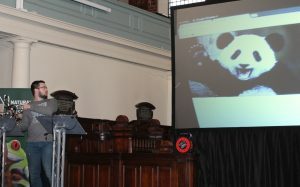 HONOURABLE MENTION: This entry also received an honourable mention for the Natural History Open Data Challenge. PRIZE: Two Samsung Gear VR headsets, donated by Samsung.